Hunter has completed his first year in graduate school pursing a dual Master in Public Administration/Master of Arts in Critical and Curatorial Studies at the Hite Art Institute, University of Louisville; he is a native Louisvillian. I received my undergraduate degree from Transylvania University in Studio Art last May and now am pursuing a Master degree in Critical and Curatorial Studies at the Hite Art Institute, University of Louisville. The shift from amateur art-maker to aspiring exhibition producer has provided its share of challenges, namely in the language and art historical methods I now use. My personal appetite for participation in the broader arts community, however, has remained the same. The school year ended in the early weeks of May, and I began researching summer opportunities. I was soon offered a fellowship at KMAC. As part of the Fellowship, I was given the chance to use KMAC’s permanent collection to display a selection of works in their Brown Forman Gallery. Director Aldy Milliken and Associate Curator Joey Yates often use the summer months to present works from the collection in a gallery setting, and this was sure to be a great chance to practice some of the curatorial methods I had been learning in school. KMAC begins planning their exhibitions as far as two years out in some cases, so completing the show in little over one month seemed like a tall order. KMAC’s permanent collection contains works by acclaimed regional and national folk artists. 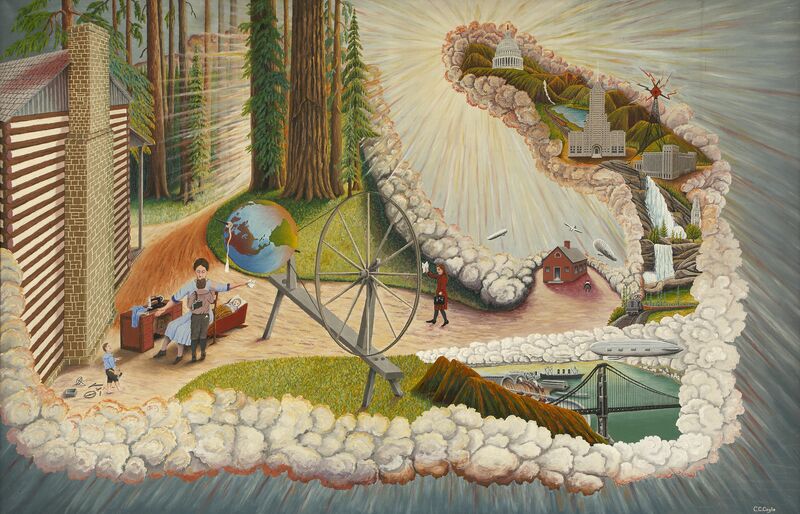 Artists from Eastern Kentucky and Appalachia are heavily represented in the collection, and as a result themes of economic agriculture, religion, American identity, and wildlife are all very present. After browsing the catalogue of KMAC’s permanent collection and inspecting some of these artworks in person, I was able to narrow down my selection for the exhibition to about twenty pieces. I selected many of these Appalachian artists as well as some contemporary local artists working in glass, photography, or patchwork. The selection process was not an easy one. While many of these artworks deserve to be shown, a number of constraints surfaced and I was unable to include objects I really admire. My conversations with Joey Yates were emphasized with the notion that “less is more.” The idea of a cluttered gallery made us uneasy, and subsequently space had to be compromised in order to include a diversity of artists as well as multiple works by the same artist when their breadth required it. Each object needed “room to breathe” (as the popular saying goes), and my selections were heavily influenced by the gallery space itself. The final title of the exhibition was simple—Highlights from the Permanent Collection. There was no need to contextualize these works. The collection speaks for itself. 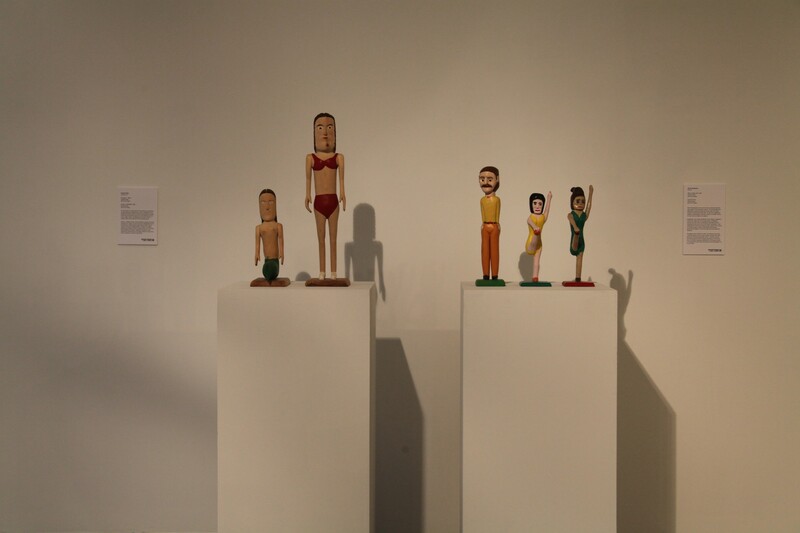 The final display includes artists like Earnest Patton, one of the most renowned artists in KMAC’s collection, who carves human figures with precision and clean technique. His depiction of Adam and Eve is as topical as that of his mermaid or woman in a swimsuit. Minnie Adkins’ use of a fox motif translates fluidly from woodcarving to quilt, demonstrating the artist’s ability to execute in a variety of mediums. Carl McKenzie’s figures stand as anomalies, distanced from the comparable work produced by Patton, Denzil Goodpaster, and Junior Lewis. His splotched Lady Liberty and Red Cross Nurse are vibrant takes on popular subjects. Finally, Marvin Finn and his flock of familiar birds are at hand within KMAC’s collection. 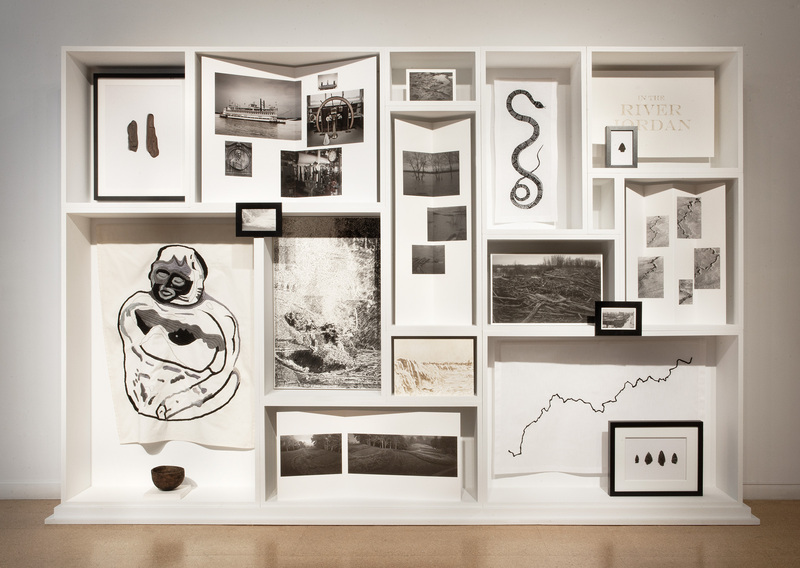 The resulting exhibition advocates for the importance of collecting. Under Milliken and Yates, KMAC is transforming from an artist-represented gallery into an archival museum. KMAC’s current collection is a solid foundation for a more expansive holding of artworks. Highlights marks a checkpoint for an evolving institution. 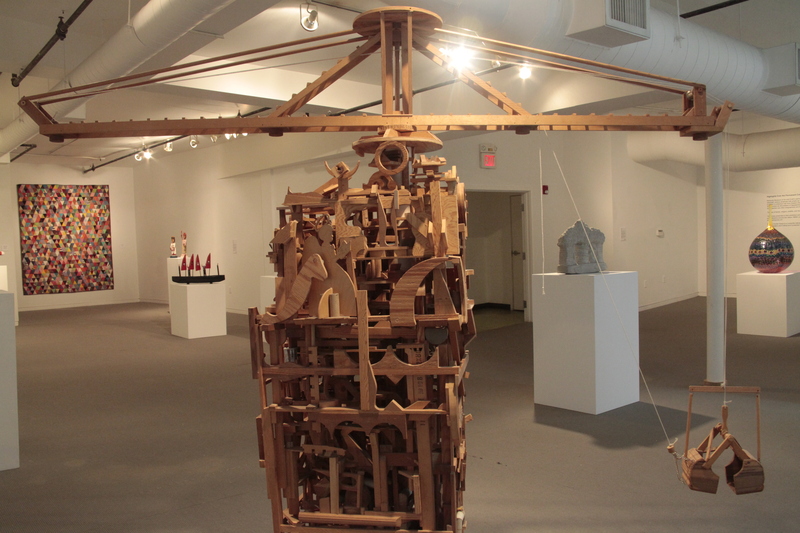 Highlights from the Permanent Collection, curated by Hunter Kissel, will be on display in the Brown Forman Gallery at the Kentucky Museum of Art and Craft until mid-September. To see more from the exhibition, visit http://www.kmacmuseum.org. Image: Al Gorman, “Alien Ballet” from the blog post Top Secret Report: Proof of Extraterrestrials March 3, 2013 by artistatexit0. The Ohio River flows for more than 600 miles across Kentucky’s northern border creating a watercourse through the bordering states of Ohio, Indiana and Illinois. The confluence of commerce and community building that has taken place along the banks of the Ohio River for centuries is not unlike the development of societies around similar river networks throughout the world. These densely populated settlements depend on these rivers for nearly every basic need. For generations their identities have been shaped by the geological and environmental history of the river. Our evolving relationships to science, industry and religion have been heavily influenced by river societies since the beginning of human civilization. These ideas intermingle in Andrew Underwood’s work The River, 2013, currently on view in the 7 Borders exhibition. Focusing on the motifs of fertility, time, and spirituality Underwood has woven, painted, photographed, collected, assembled and displayed a complete narrative of the history of the Ohio River from the prehistoric era to Native American cultures and into the Industrial age of steamboats. Set into a tailor made system of shelves Underwood incorporates the theme of fertility, most notably with an embroidered mother figure, but also through different iterations of the vessel, drawing connections between a Cherokee Bowl and photos of the century old steamboat the Belle of Louisville. With comparisons between the Ohio River, the Ganges River and The River Jordan he reminds us that cultures have long used the river for spiritual purposes, both for baptisms and burials. Al Gorman began his project of documenting the Ohio River in 2003 and in 2009 he was able to take this process global with the start of his blog artistatexit0.wordpress.com. 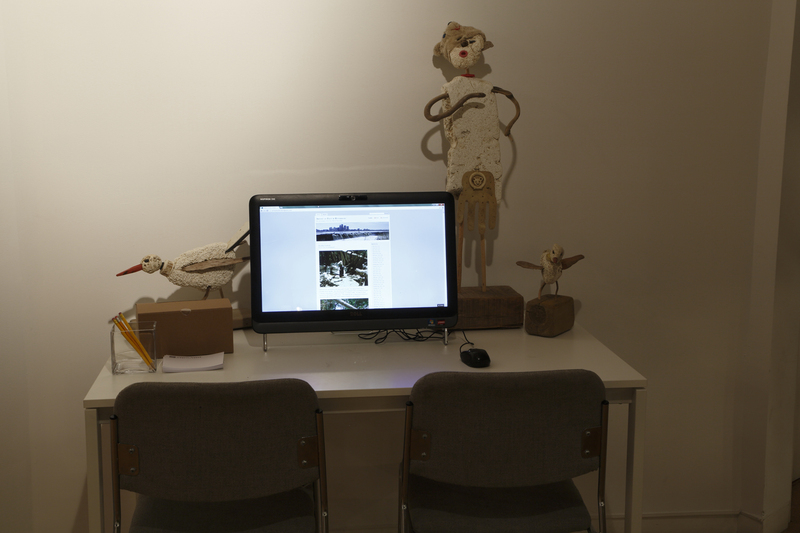 A table placed within the 7 Borders exhibit contains a monitor with the blog along with a few of Gorman’s driftwood sculptures. Visitors of the website can follow his almost daily excursions to the Falls of the Ohio State Park located off of Interstate 65 in Jeffersonville, IN at Exit 0. Through storytelling and photography his documentation of found trash and driftwood has proven to be inexhaustible. The blog contains pages and pages of driftwood sculptures assembled on site by the artist and trash that Gorman has collected and classified into categories such as Balls of the Ohio, Kentucky Lucky Ducky Collection and Plastic Bottle Color Spectrum to name a few. It’s a three-part collusion with the artist, the people who have lost or thrown these objects away and with nature, which in this case happens to be a series of 390-million-year-old fossil beds. He raises concerns about our lack of knowledge or interest in where our garbage ends up, particularly with our abundant use of plastic. Al Gorman, 7 Borders Installation. Greg Stimac’s photograph Ancient Colony of Horse-Thieves, Counterfeiters and Robbers captures the mysterious and menacing history of a cave located on the banks of the Ohio River in Hardin County, Illinois. The site was known to be a hideout for notorious river pirates, highwaymen, serial killers and civil war bandits. Better known as Cave-In Rock it was used by Native Americans for thou­sands of years before the 1790s when it became a well-known stronghold for a gang of bandits led by Gregory Mason. They would prey upon the ferryboats carrying farm produce down the river from Kentucky, Ohio, and Southern Indiana. Stimac often investigates cultural sites that contain unique aspects of American History. 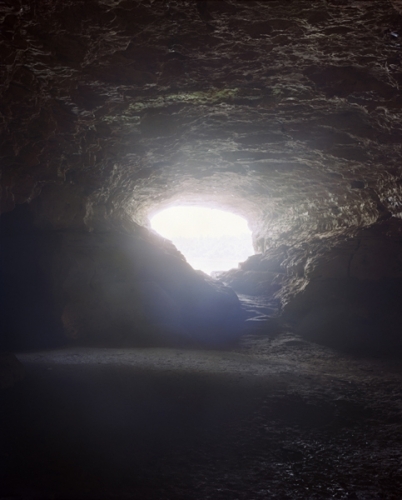 His work in the 7 Borders exhibition is part a photo series of cave entrances located throughout the Midwest. Each one of these caves is associated with a famous American criminal or crime scene.